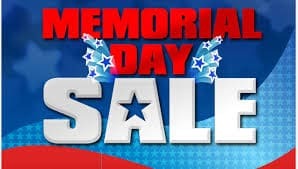 Memorial Day Sale is one of the summer’s biggest shopping holidays, and retailers have amazing deals on mattresses, furniture, appliances, apparel, electronics or clothing. Memorial Day 2018 is on Monday, May 28th. Memorial Day is one of the best holidays for finding amazing deals for summer items. You can use digital and printable coupons to add up the savings. Sale: Up to 40% OFF Memorial Day Savings, including 30% OFF for LG Hom-Bot Robotic Vacuum. Free Parcel Shipping with MyLowe’s. – save $10 to $40 via Rebate – Paint + Primer, Exterior Stain + Sealant and Resurfacers. Offer ends 5/30/18. Sale: Up to 40% OFF Memorial Day Appliance Sale. – Up to 30% OFF on patio furniture and outdoor power tools, and save up to 15% for grills. Sale: Up to 40% OFF Memorial Day Appliance Deals, including $500 off a Samsung Family Hub 4-Door. – Save up $200 on select MacBooks. – Windows computers starting at $199.99. – iPhone 8 and iPhone 8 Plus, save up to $200. – Free $50 e-gift card with Xbox One X. – $350 savings and free bag with Nikon D3400. Sale: Up to 30% OFF + an extra 15% OFF patio furniture. Online only with code HERO. – Up to 30% OFF home + an extra 15% OFF furniture & rugs. Online only with code HERO. – Extra 15% OFF Casper mattresses on top of sale prices. Online only with code HERO. – 30% OFF bedding & bath items. – Free $200 gift card when you buy Samsung Galaxy S9, S9+ or Note 8. AT&T & Sprint only. – Save 25% on mountain bikes & kids’ character bikes. – Free $5 gift card when you spend $15 on sun care. – BOGO 25% OFF skin care products. – BOGO 50% OFF salon hair care items. – Buy 3, get 1 free cereal & granola. – $9.99 each Starbucks K-Cup coffee packs when you buy 3 packs. Sale: Up to 40% OFF on select appliances, and get 50% OFF Kenmore Elite washer and dryer pairs. – Up to 30% OFF grills and up to 50% off patio furniture. Plus, get an extra 10% off with the promo code: SALUTE. – $899.99 for Kenmore 26.1 cu ft French Door Refrigerator, save $900. Delivery and basic installation are free. – 40-60% OFF + 15% OFF Patio Furniture. Use Promo Code: 2FORHOME. Sale: Extra 15% OFF on All Sale & Clearance Apparel and Extra 10% OFF All Sale & Clearance. Use Promo Code: MEMSLP. Valid: 5/23-5/28/2012. – Free Shipping with $49 purchase + Free Returns. – Get an Extra 20% OFF any order. Use Promo Code: MEMDAY. Valid from May 23 through 28. – 10% OFF when you spend $25 or more. Use Promo Code: SERVICE10. – 40% OFF for all outdoor dinner & serve ware, table linens, & kitchen towels. – 25% to 50% OFF Dresses. Sale: Buy One get One 50% OFF on all Walgreens Brand Beauty. View the Walgreens Weekly Ad. – 20% OFF for All Contact Lenses. Use Promo Code: DEAL20. – Up to 50% OFF for Vitamins. – Up to 60% OFF Clearance. – Free 1-3 day shipping at $35+ or Free ship to store. Sale: 30% OFF sitewide + free shipping, no minimum. Use Promo Code: 30FREESHIP. Sale: Up to 50% OFF on Kitchen, Dinning, Bedding items & more. – 20% OFF One Item In-Store. Sale: 50% OFF for all online merchandise. Use Promo Code: PARTY to get another 20% OFF on top of that plus free shipping. Valid through May 26 at 11:59 p.m. ET. Sale: Up to 35% OFF Sitewide + Extra 15% OFF Entire Purchase. Use Promo Code: FREEDOM15. Valid until 5/29. – 5 years Financing – No Interest, No Down Payment, No Minimum Purchase + 15% OFF. Sale: Take 50% OFF on regular menu price orders. Use Promo Code: 50WEEKEND. Limited time offer at participating Papa Johns restaurants. Sale: Take 20% OFF Sitewide. Use Promo Code: SP3TWPC. Limited time offer. Sale: Get up to 60% OFF In-store and Online. Sale: $40 OFF when you spend $300+ at select Hotels. Use Promo Code: MEMDAY18. – Up to 40% OFF + Extra 8% OFF your order. Use Promo Code: TAKE8MAY18.